Nelson Sabates, M.D. ’86, chair of ophthalmology, spoke at the University Health ribbon cutting ceremony. A new outpatient specialty and surgery center on Hospital Hill will expand and enhance the learning experiences for UMKC School of Medicine students and residents. Truman Medical Centers will provide the services at University Health, a 90,000-square-foot facility at 2101 Charlotte St. In addition to clinic space and operating rooms, University Health will house the Vision Research Center, the research arm of the UMKC Department of Ophthalmology, and a 50-seat theater with a 3-D projection system. University Health opened Oct. 28 with a ribbon cutting ceremony and open house. Services provided at University Health include ophthalmology, orthopaedics and sports medicine, oral and maxillofacial surgery, obstetrics and gynecology, plastic and reconstructive surgery, urology, otolaryngology, pain management and outpatient surgery. 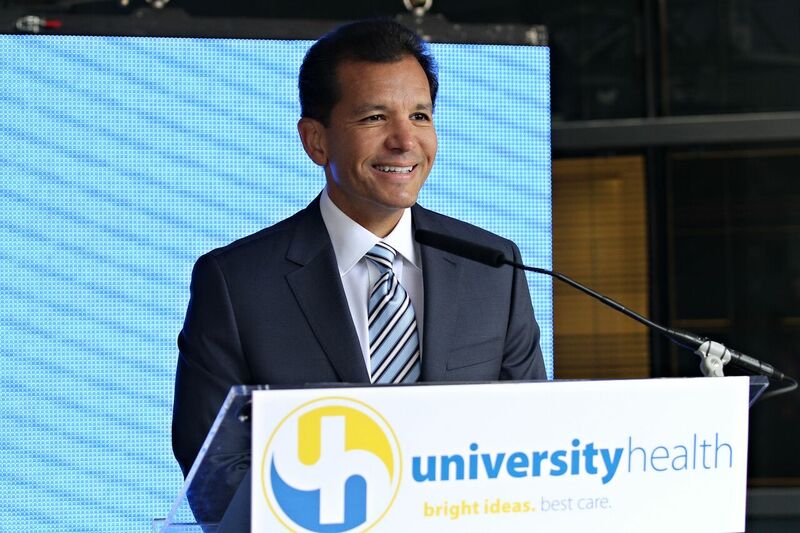 Shields said the University Health name was chosen to emphasize Truman Medical Centers’ status as a teaching hospital. “One of the things we are most proud of is our connection to the UMKC School of Medicine,” he said. UMKC School of Medicine partners with Saint Luke’s Hospital of Kansas City, Children’s Mercy Hospital, the Center for Behavioral Medicine, the Kansas City Veterans Affairs Medical Center and Research Medical Center, in addition to Truman Medical Centers.